This post is sponsored by Farm Rich. As always, all opinions are my own. 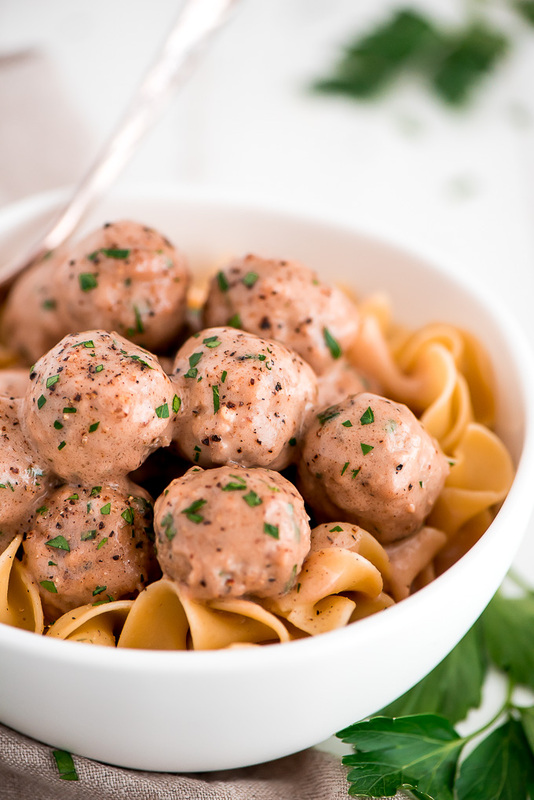 These 20-Minute Swedish Meatballs are the perfect easy and effortless dish for a quick meal for the family or an at-home-dinner date. I don’t think there’s any food more romantic than a comforting pasta dish. The Italians know what they are doing. 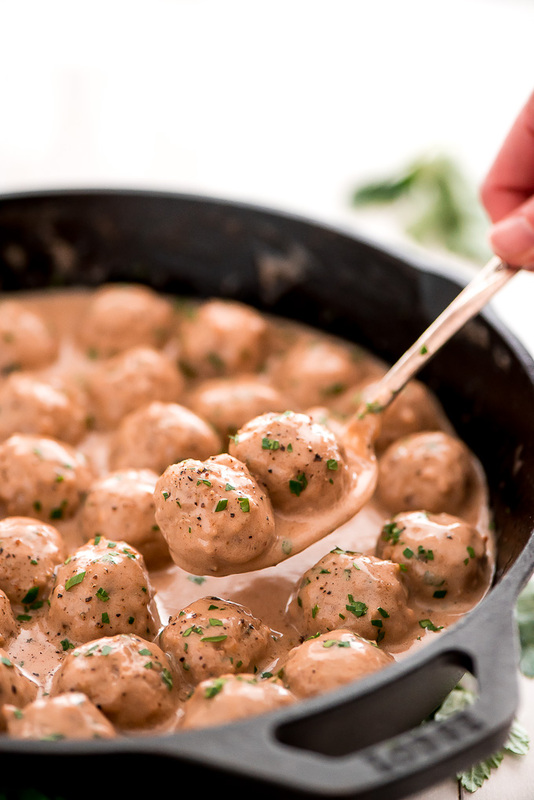 And in the case of these Swedish Meatballs, so do the Swedes. 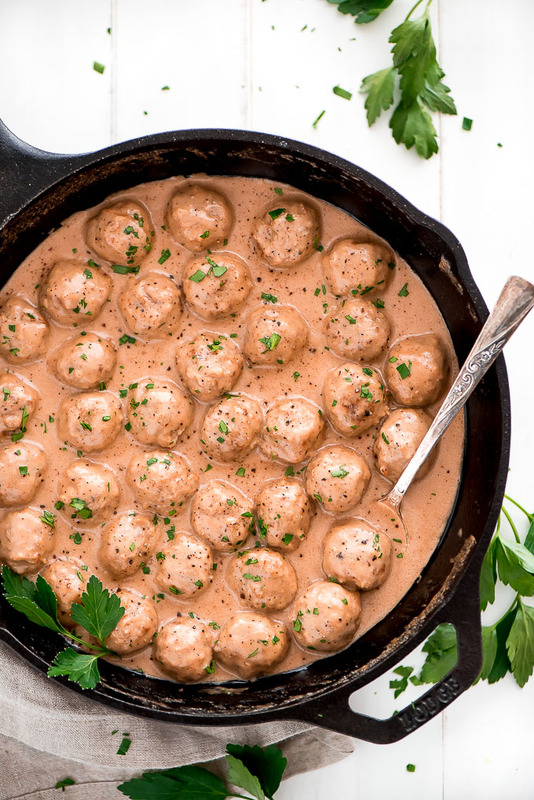 These Swedish Meatballs are perfect for a stay-at-home Valentine’s Day dinner date. I mean who really wants to pay for a baby sitter to go out to a restaurant that’s super crowded, and the hostesses are shuffling people in and out like cattle? This dish is perfect for an at-home-dinner (or even a weeknight meal!) not only because it’s deliciously good but also because it doesn’t require much work or waiting. 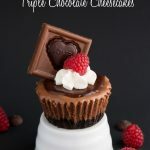 If you’re in the kitchen too much already and just want to relax on your date-night-in, this is the way to go! 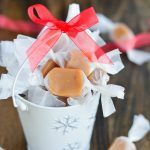 As much as I love to make things from scratch, chasing around two little ones all day makes life a little busy, so sometimes I take shortcuts like using frozen meatballs. 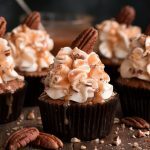 Honestly, they are just as yummy and 10 times easier. I don’t have to get my hands dirty, clean up raw meat or multiple dishes, or wait longer for them to cook. 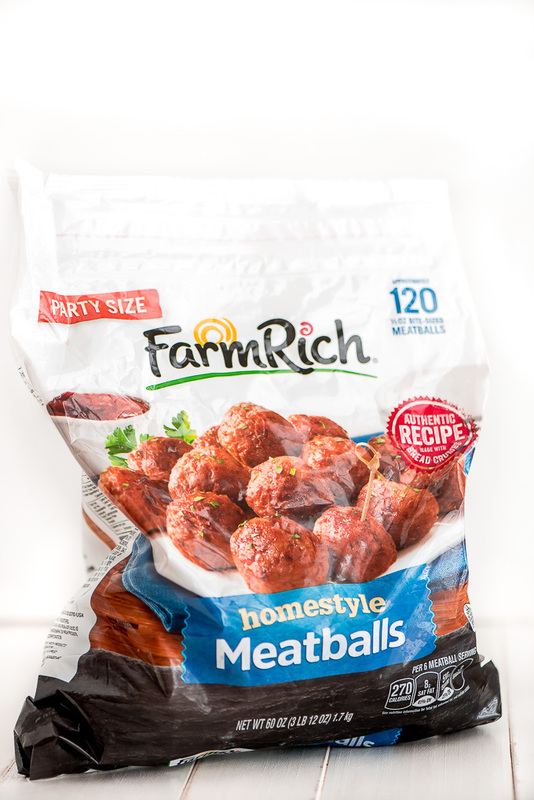 Farm Rich Meatballs are perfect for busy families because they’re made with wholesome ingredients, packed with 11 grams of protein per serving and are fully cooked so all you have to do is heat them up enough until they are warmed throughout. My favorite way to do this is just by tossing them into a sauce and allowing them to warm while the sauce thickens. This also helps the meatballs take on the flavor of the sauce. 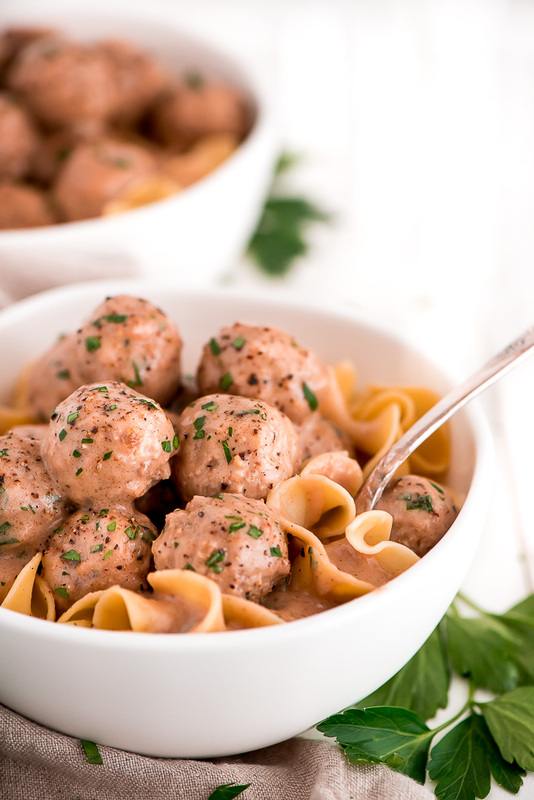 These Homestyle Meatballs are bite size which allows them to cook quickly and are great for the kiddos. 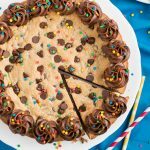 You can find them in the freezer section of grocery stores nationwide, including Walmart. Have all your ingredients measured and ready to add to the skillet since this meal cooks quickly. You don’t want to burn the roux (butter and flour mixture). To save time and make sure everything is ready at the same time, start the recipe out by heating up and boiling the water for the noodles. Make your own beef broth using beef bouillon and water. This is more affordable and you won’t have any waste. Whisk– I prefer this narrow whisk when cooking sauces in a skillet compared to the balloon whisk I use when mixing batters in a bowl. Begin boiling water for egg noodles and cook according to package. Meanwhile, in a large skillet, melt butter. Whisk in the flour and cook until mixture turns brown. Whisk in the broth, cream, Worcestershire sauce, and mustard. Add the Meatballs and bring to a boil. Reduce heat to medium-low and allow the sauce and Meatballs to simmer 10-12 minutes until sauce is thickened. Stir occasionally. 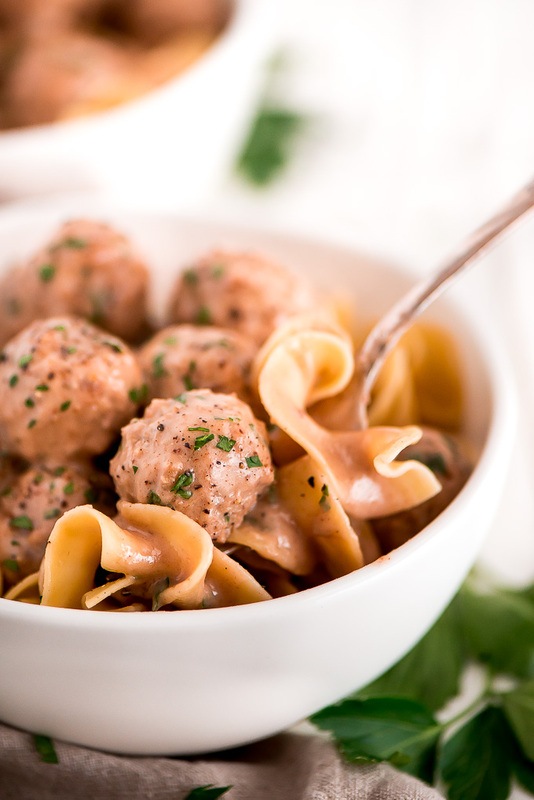 Dish up egg noodles into bowls and ladle the Meatballs and gravy over the top. Garnish with fresh cracked pepper and parsley. Serve immediately.